Welcome to this website which is provided by Harleston Information Plus. We hope the site enables you to find out more about our organisation’s work, the town of Harleston and surrounding area. 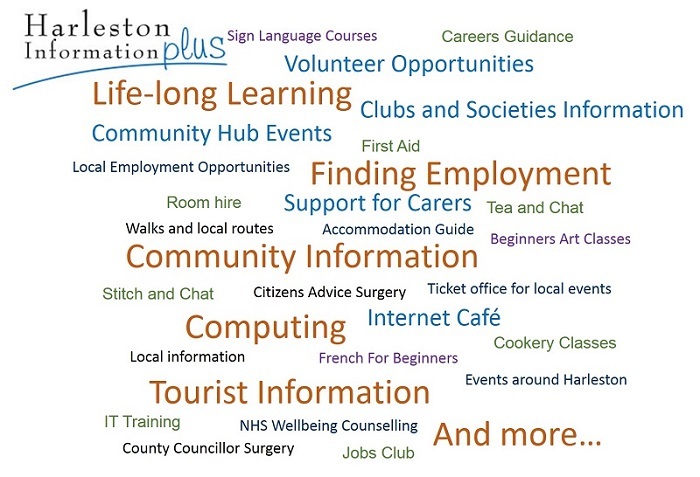 Harleston Information Plus is a local charity working to support people to be independent, achieve their full potential, and actively participate in the community. The charity has a voluntary management board made up of local people and with the help of around 40 volunteers provides services and support to over 6500 people each year. Our services include Harleston community information centre, a local jobs club, work skills training programme, lifelong learning opportunities and regular social activities. We are based at 8 Exchange Street in Harleston and cater for residents that live in the town and the surrounding villages of Norfolk and Suffolk. Harleston Information Plus is a registered charity funded through grants and donations. It costs £45,000 per year to run our services. We struggle to find this money each year, to see how you can help please look at 'How you can help' on this website. We would like to give thanks to the organisations that have supported Harleston Information Plus in recent months: Harleston Town Council, South Norfolk Council, Better Together Norfolk (Loneliness South Norfolk outreach) Norfolk Community Foundation, LIFT ESF fund (Jobs Club) Fressingfield Eleemosynary, Santander Discovery Fund, The Lodge of Marksmen, Stitch and Chatter, Handsomes of Harleston, Malthouse Stitchers, the East Anglian Cooperative Society, Coop Community Fund, Harleston Community Craft Group, Londis, London Road, Grapevine. For more information about the organisation or services offered please use the links on the side of this page.